We finally have been getting rain in San Francisco and the Bay Area! After the driest year in recorded history, it’s been raining hard and almost non-stop, adding around 9 inches to our parched landscape! Hooray! 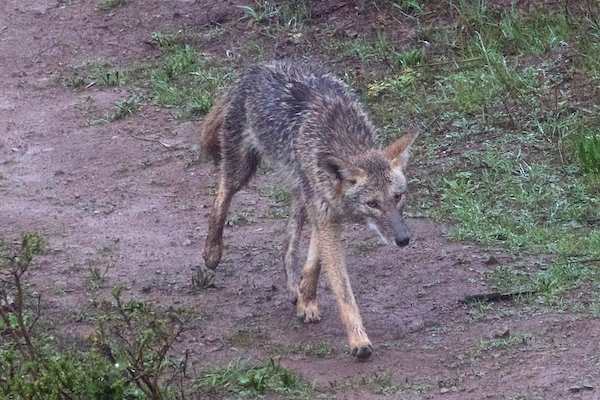 The younger coyotes here are new to rain, having experienced only one previous short rainfall in their entire lives! Youngsters born last year are stepping high through the mud, and holding their ears down, gloomily, showing that this is not the happiest of situations for them — we’re all wary of what is unfamiliar. This heavy rain will change all that! 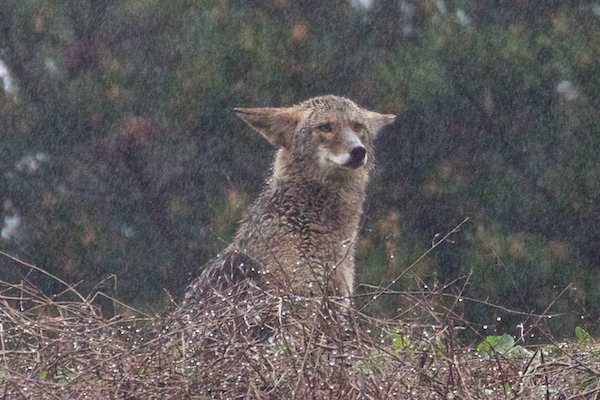 Older coyotes who grew up with rain are taking the downpour in stride: they enjoy sitting in the rain and watching the few walkers who are willing to venture out in this weather. Hunting is often better during and after a rain, and, most importantly, rain provides an opportunity for a nice “shower”: the rain soaks in and the coyotes shake it out, which loosens the dirt and sends it flying. Previous Vying for Dad’s Affection Again: Who Gets Dad? Next Paws on Pop: More Vying for Dad’s Affection, for Possessing Dad, or Just Family Closeness? What a great site! Thoroughly enjoyed it! I live in Colorado and, of course there are coyotes are all over the place. I am a photographer and photographed many in Oklahoma, but now in Colorado found many in Rocky Mt. Arsenal refuge that have hairless tails. Is this indicative of mange, even though the rest of the coats look ok? It’s just so odd as wherever I’ve seen coyotes before, they’ve had full coats and tails… Thanks for your feedback.